One of the most exciting things about Star Traders RPG for us is how much feedback it has generated from Android users around the world. A great number of people have embraced the game and have sent in suggestions, encouragement and inspirational best wishes. Without those people, ST RPG would never have reached the point it is at today. This player's exploits and exploration have taken her Crew all across the known Quadrant and beyond, the to very fringes of accessible space. Not only did she bring back a great number of Artifacts, but 5 very valuable Records were also created of her journeys. With her permission House Thulun and I have coordinated to host these records where Pirates and Bounty Hunter alike can view them. 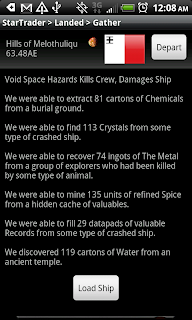 Among these records are secret details of the known wild planets and civilized outposts as well as in depth statistics on most of the game's secret and semi-secret ship technology. These secret documents (and their publication on the Captain's forum) caused some stir! I was pretty shocked myself and put up a few posts on Twitter at http://twitter.com/#!/corytrese -- you know, just to warn my operatives that everyone was on to us. Another shout-out has to go to PlayDroid who went as far as to build his own Player's Guide! I'm very glad to see your game taking off. I have the free version and I think I'll be springing for the elite soon. It's just so surprising how addictive this game really is. It may not be the fanciest or shiniest game out but there's just something about it. Reminds me of playing text based MUDS... depth, replayability, and a good dev open to suggestions from the community. Look forward to many exciting updates! I'm enjoying the elite version after feeling like a big enough fish in the free pond. I like the depth and replayability Elderon mentioned. As for suggestions, I like the clean star map interface, but it would help immensely if there could be some kind of flag or tag letting you know background about a planet - like a small flag or even a background glow indicating house/syndicate/independent affiliation. I wouldn't ask for name tags cluttering up the field, (I like the transparent deep-space markers) but maybe add a planet name label once you tap and put a waypoint on the planet. I spent several hours recently looking for Riverton, tapping every fricking planet on the map at least twice because I'd left a good ship in drydock there (and the planet is named Tapella). Thanks for the suggestion! There is some on-going work to enhance the star map, with sweet options that map to how you expect to use touch screens. Definitely will take your feedback into account to help clean up (but make more accessible) the colors and labels across the map. Glad you finally found Tapella! Love the game, actually sprang for Elite cause i lost enough hours on the standard version. But the Star map can get very confusing after a few hours running around playing at being an explorer so some basic upgrades wuld be worthwhile to make it easier to get around. Took me 30 hours of game play to realize I needed a scout and how to get one, which i figured out quite by accident, and that's what I love about this game is that after so long I can still find neat things out by accident. But anyway gratz on the game definitely worth the 1.99 to upgrade. @mykey - thanks for the feedback! The game keeps growing, so keep and eye out for new features, new ships, and new things you could find on hour 60! Have you tried Templar Assault, which is based in the Star Traders universe? Question: How do you finish the game ? @andrei - Star Traders is a game about survival. There is no specific victory condition. Captains can capture awards, accrue mass wealth, or gather a fleet of ships. If you are winning on a lower difficulty, try upgrading to a harder one.